Due to the heavy nature of the vast majority of ironmongery products, delivery in the main is via a tracked courier service who are better equipped to deal with heavier items. Where possible, we do offer a more economical Royal Mail Second Class delivery option. We do try and despatch all orders received before 11am (Monday to Friday only) the same day, however, due to the volume of orders we receive this is not always possible. Certain items such as our range of Stainless Steel ironmongery and keyed alike long throw locks are in most cases a special order and despatch is usually 24 hours after an order is placed. Selected items are listed for Royal Mail Second Class delivery, these tend to be the smaller, lighter items that Royal Mail are comfortable dealing with. Second class delivery is £2.85 on all orders below £30 inc VAT. Delivery on any qualifying items for Royal Mail delivery over £30 are free. At times, we do reserve the right to upgrade any Royal Mail delivery orders to a next day courier delivery at no extra cost to yourself, so it is always worth entering any delivery instructions such as where the item can be left. Delivery would be 2-3 days from despatch for these items. We use a tracked Courier service to deliver all items where possible. This helps us keep postage costs low whilst ensuring a good quality service that delivers on time. As any order is despatched and on its way, an email is sent to the customer with tracking details which allows you to see exactly where the items are on the day of delivery along with an approx delivery slot. “Next Working Day” delivery refers to the working day following the day of despatch. Please note that we are unable to despatch products on Bank Holidays or Weekends. 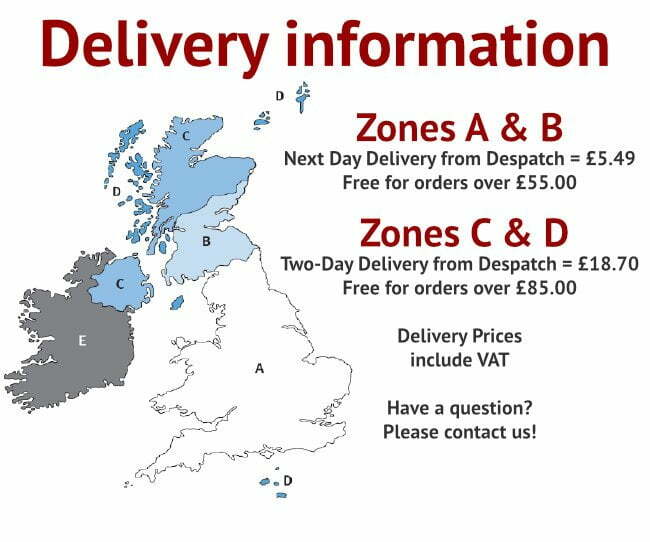 You can see shipping charges for UK areas shown in the diagram below. We also used a tracked Courier service for our ‘Gates and Doors to go’ products.